The Connetquot River (Secatogue tribe name meaning "Great River") is a 6 mi (10 km) long river in Islip. It is one of the three major trout rivers on Long Island and is recognized by the state as a Wild, Scenic and Recreational River. 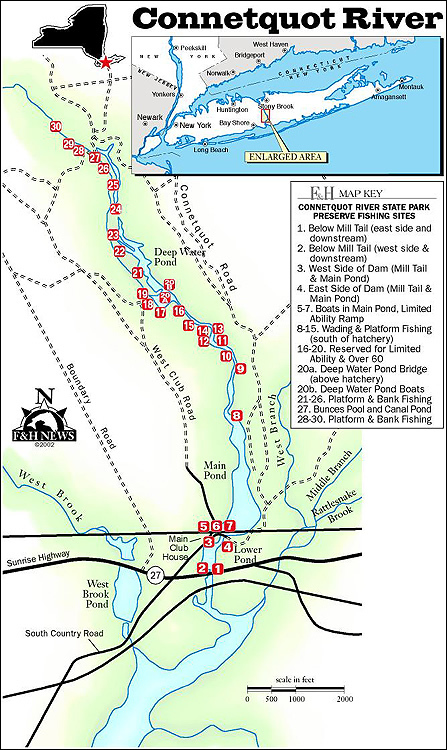 Operating on a 'beat' or site system, anglers will have to call ahead an reserve a spot on the river at (631) 581-1005. Fly fishing only. The park receives approximately 3,000-4,000 stocked brown and rainbow trout annually, as well as hosting a wild brook trout population. Contained within the park is the Connetquot Fish Hatchery which after many years of IPN infection, will be reopening in 2015 and will produce approximately 30,000-35,000 trout annually. Read about the governors announcement here. It starts just south of the Long Island Expressway from springs in the Lakeland County Park in Islandia, New York where it is called Connetquot Brook. The estuary portion south of Sunrise Highway at Oakdale, New York is officially called the Connetquot River although in popular usage both the brook and river share the same name. Reservations accepted for 30 sites available per session. Specific sites cannot be reserved in advance but are issued first-come-first choice at time of session. NO SHOW POLICY: Abandonment of reservations will result in cancellation of your remaining reservations. Anglers must STOP fishing when Two(2) TROUT are in possession - trout kept must be larger than 10 inches and less than 13 inches. Fishing must be alone with conventional fly fishing equipment limited to flies, fly rods, fly reels. and fly line with unweighted leader material attached. Any other type of fishing tackle is prohibited. Artificial flies and streamers are defined as being constructed of natural or synthetic materials, so long as all flies are constructed in a normal fashion on a single barbless hook with components wound on or about the hook. Specifically prohibited are molded facsimiles or replicas of insects, earthworms, fish eggs, fish or any invertebrate or vertebrate either singly or in combination with other materials. Likewise prohibited are other lures commonly described as spinners, spoons, or plugs made of metal, plastic, wood, rubber or like substances or combination thereof. To protect the environment ,no lead weight, split shot or other, lead items may be used. No stringers or other methods of restraining or tethering fish in the water. Fish kept must be quickly and humanely killed and creeled. Net and release fish carefully. Release your fish in the water, immediately, with care, and in the same condition it was taken. NO injured fish are to be released.The use or possession of any bait, fish eggs or fish parts, and use of barbed hooks or any other fishing device other than barbless hooks, artificial flies or streamers is prohibited.